Ordination ceremony. Holy Free Corner Stone Church of Zion (15). 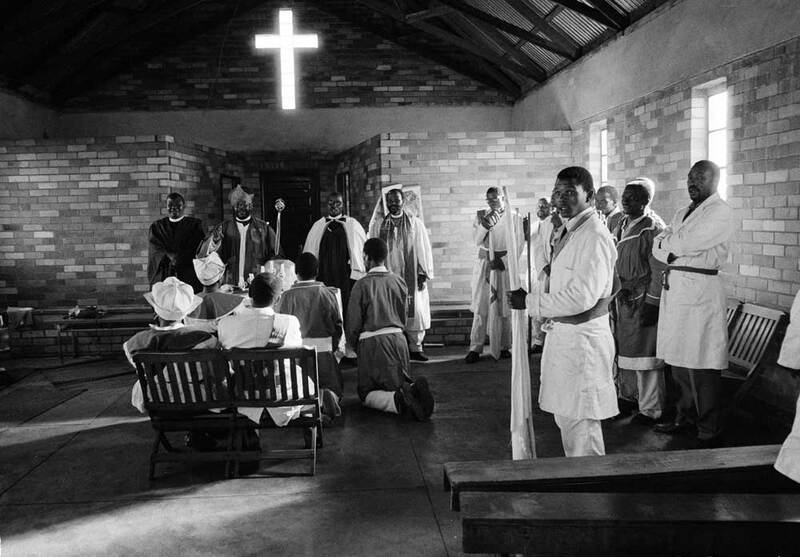 Held in a hired church in Mofolo, and presided over by Bishop M M Nkosi, 1171 Mofolo North, Soweto, second from left of those standing. On the left is President S G Nyangwa of the United National Church in South Africa (3), a church of the “Ethiopian type” (see Martin West, Bishop s & Prophets in a Black City, pp 16ff.) His presence was owing to the fact that he was a fellow Board member, with Bishop Nkosi, of AICA. West, Martin, “AICA board member President Nyangwa at HFCCSAC ordination ceremony presided by Bishop Nkosi, Soweto,” Martin West, accessed April 20, 2019, http://www.martinwest.uct.ac.za/items/show/10469.